50 Stones - 6 1/2" H x 5 1/2" W Approx. Stunning Brazilian Amethyst Gem Trees. 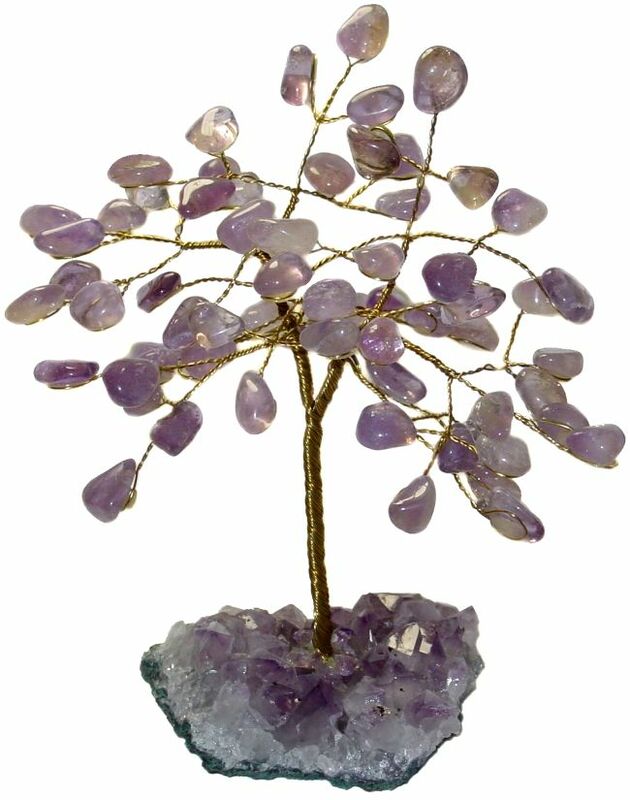 Beautiful hand crafted gem trees, have a solid Amethyst Druze Crystal Cluster base. Amethyst is a stone of spirituality and contentment, it magnifies the energies of Love, Forgiveness and Healing. The crystal energies naturally blend into the universal "Tree of Life" symbolism and help to ground those who meditate on it. The branches are no tarnish brass wire with 30 or 50 individual large Amethyst polished stones on each gem tree. It is representative of the principle of complete metamorphosis. It bestows stability, strength, invigoration and peace. From antiquity it has symbolized sobriety or self-mastery.. Therefore it passes on the ability to release one's addictions, physical, emotional or otherwise. It magnifies personal energies of love, forgiveness, healing by concentrating upon the stone.